2 toughies and saying good bye to my 30s ...does that mean I am over the hill (s)? Not keen on another solitude hill walk, I was glad when Spiderwebb (already an UHU) said he would join me. We met at the car park in Kenknock at 10am on Sunday and set off into the beautiful morning. I had done some research and decided to follow the so called bog free route. Chatting away we walked along the easy path and crossed numerous new gates. Ben Challum was rising in front of us and Dave told me that he had originally planned to do Beinn Heasgarnich and Creag Mhor as part of a group of 4! 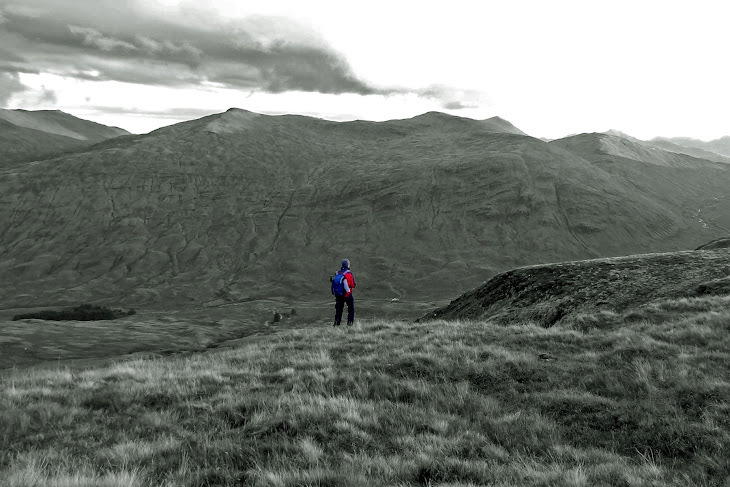 Around an hour into the walk we checked the map, discussed our options and decided to head up Beinn Heasgarnich first. The path we were on was so dominant, that chatting away we were soon way past the bit we had wanted to climb up. Neither of us had seen a path either and stopping we checked the GPS. Mmm walking back would be annoying, but since we needed to climb 2 Munros anyway, we just set off to climb them in a clockwise order, making Creag Mhor the first Munro of the day. If there was a path we certainly did not see it and so we just picked a spot and climbed up towards a gate in the fence. Crossing the fence we looked up and even though it would have been a exciting scramble, the rock was wet and so we decided on a very faith path along the fence. Climbing higher and higher the path continued, but did not lead up the hill. Checking the map we had to leave the path and cut across the rough ground to the top . There was a short distance of path on the map, which we aimed for, but which annoyingly did not get any closer. I am not sure how long we had climbed by that time, but not being able to see the summit was rather de-motivating! Huffing and puffing we climbed higher and higher until we reached the first flatish area and were finally able to see the summit. Dave suggested a coffee break and sitting down next to a huge boulder we gazed into the distance and tried to figure out the names of the hills we could see...pretty unsuccessfully! Getting up we made our way to the top of Creag Mhor and looked across towards Beinn Heasgarnich. From our viewpoint it was one of these rather un-inviting hills, for which you have to loose a lot of height only to climb the same height again on the other side. The bottom between the two was also covered in peat hags and I kept my fingers crossed that we would escape boggy ground. No point hanging around, we followed a path down which seemed to lead away from the mountain we had to climb. Confused we discussed if it would be better to drop to the right, but I remembered from the map that we would have to walk a loop. Just as well, as when we reached lower ground and looked up the hill, steep cliffs would have made the climb down near impossible. On the way down Dave shamed me by falling into a light run down hill. One thing I will never be able to do! Following slowly I reached the peat hags were he was waiting for me. They had seemed worse from above and yet again our feet stayed dry while we navigated a walk across it. The path had yet again stopped and the only sound we could hear was the rutting sound of the stags in the distance. Having another break to eat some food we looked up the final hill. A faith path lead up the steep slope and when we set off, we were happy to follow it. It seemed endless and knowing that there were 2 blind summits did not make the walk any easier. I was glad that I had company, as chatting away made the steep path less noticeable. When we reached the first blind summit the top was still some distance away, but at least we seemed to have covered most of the height we had to climb. Walking along was pleasant especially when the views opened and we could see towards the Lawers range. By the time we had reached the final summit of the day, golden evening light highlighted the hill site around us. It was one of the most stunning views I had experienced and I don't know how long we stayed up the summit taking photos. The approaching sunset made up realise that it was time to leave and setting off we made our way down to the path. Again if there would have been a path we did not spot it and the climb down took a lot longer than we both expected it. It was relentless and discussing which way would be the best way up, we decided that it was probably good we had missed this one in the morning as it seemed worse than the one we climbed up. Last edited by Mountainlove on Tue Oct 14, 2014 2:26 pm, edited 1 time in total. I had been planning these two with Challum, but couldn't face the enormity of the task. Now I think this is the way to go with it. It was a cracking day, we were at the Ben More 7, just over the road and stayed to watch that beautiful sunset. I did these in winter due to being pathless, still remember it hard going though. Well done! These two seem very innocent, but I also found them tough. You captured the evening light fantastically. And happy birthday! Ha Your never that old ....are you ! Sunday was a cracking day for the hills ~ I was opposite you on Meal Glas and Sgiath Chuil ~ stag city and not the partying type. I did these two a few weeks ago and they certainly made a great circuit. Beautiful photos of an area I haven't visited yet... Long drive down south for us, but I see, the mountains are worth it. Glad to read that I was not the only one who thought the hills were tough...kind of hoped for an easy day... wishful thinking I guess.